The planet turned up the heat at WHAP in mid July. The Wolves and caretakers were not happy with temps in the mid 90s and above. It was morbidly humid. Our dogs and Wolves actually started to blow their coats again. 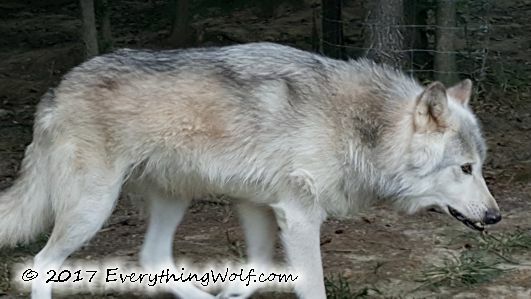 Outside of the hot weather, the Wolves are all doing well. It’s pretty peaceful in the Wolf enclosure. I put together a small video of some of their antics this past month. One night I was sitting outside on my porch and the Wolves decided to serenade me. I’m sharing a portion of that with you. Though you can’t see them because it was dark, you could hear them singing with the crickets. This is something I love about Wolves. Their howls go right through me. Wolves howl for assorted reasons. In this particular howl, I think they were celebrating the coolness that sundown and a moonlit sky brought them. Enjoy. I'm happy to report that the last few days of July were delightfully cool. We actually went down into the 60's several nights in a row. The Wolves were loving it.